We are united in the experience of finding internal and external strength through pole dance, aerial, and grounded movement. soFly Social is the place for you to learn to levitate. We are a boutique pole dance fitness studio in an intimate and energizing space on the east side of Austin, TX. We offer group classes, private lessons, and private parties for birthdays, bachelorettes, and other special events in pole dancing, lyra, and other aerial apparatus. The soFly Social tribe is here to welcome you home. We are here to support, challenge, and nurture your unique movement journey as you lift off and discover your internal and external strength with a sense of levity. We’re here to laugh, cry, and hustle together. 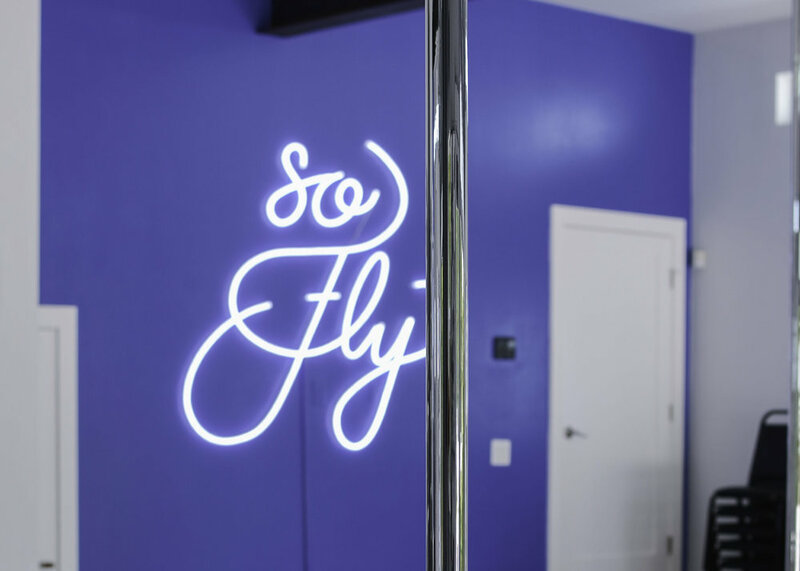 With 24 classes a week in pole, lyra, flexibility, strength conditioning, and grounded dance, soFly Social offers both daytime and evening classes to work around your schedule. *Open studio is only for individuals with existing pole and aerial experience. If at one moment you're going "whee!" and then a split second later you're screetching "arghdsfer##$@@#!!!" on spin pole this class is for you! We will learn how to mount, dismount, and utilize the forces of physics to create beautiful shapes and transitions on spinning pole. Pole Fusion brings together beginner/ intermediate pole tricks with a variety of other dance styles, ranging from Broadway, Tango, Swing, Salsa, and more! You will learn choreography, develop character & acting skills for performance, and build ground dance techniques to compliment your pole studies. Using the techniques of High Intensity Interval Training, we will target all of your needed aerial muscles, and their lesser used counter parts to give you a balanced and strong aerial body in a fun 45 minute class, followed by 15 minutes of active stretch cool down. No experience necessary. All are welcome to join! sometimes we slink like strippers. sometimes we take a step back.